Home » Our Doctors » Jolene A. Reiter, O.D. Dr. Reiter specializes in contact lens fitting. She is an expert fitter of the new soft bifocal contact lenses. She also fits contact lenses for astigmatism, gas permeable and hard-to-fit contact lenses including those for keratoconus. Dr. Reiter can also treat many eye diseases, write prescriptions for topical eye medications, and remove foreign bodies. She regularly attends continuing education to keep up on the latest developments in the field. Dr. Reiter grew up in Columbus, OH. She received her Bachelor of Science degree with a major in Microbiology at the Ohio State University. After graduation, she worked for Ohio State as a research assistant at the veterinary college and did research on cats. She decided that she was more of a people person and so she decided to change careers to one that would improve the lives of others. 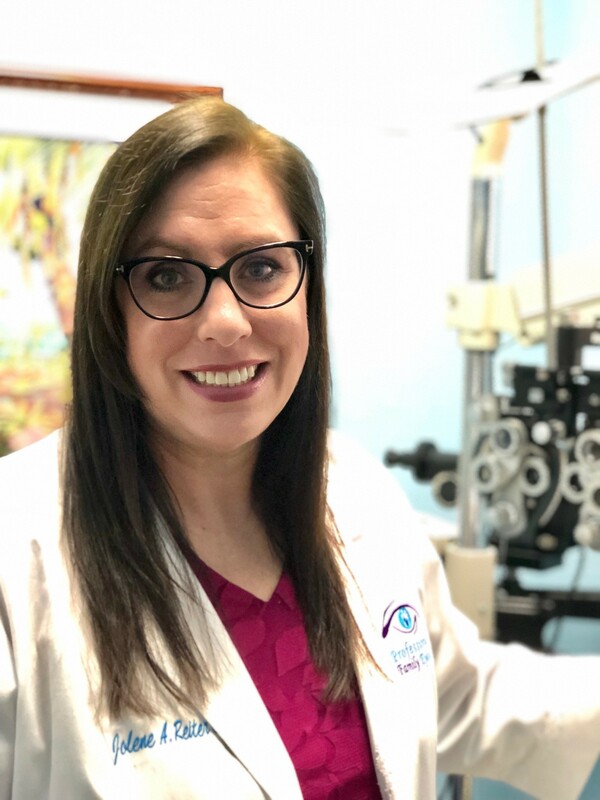 Dr. Reiter attended the Illinois College of Optometry in Chicago, IL and after four years, received her Doctor of Optometry degree in 1995. She worked in Chicago for almost a year before moving to Florida to be near her family. She has worked for large optical chains, a private practice and for an ophthalmologist. She was excited to open her own practice in 2007 where she could have the latest in technology in order to provide the best examination possible. Dr. Reiter is a past president of the Palm Beach County Optometric Association. She served as Vice President of a BNI networking group. She also is a member of the Palms West Chamber of Commerce and participated in the Leadership Palms West program. Dr. Reiter believes in giving back to the community. She volunteers her talents once a month at a medical mission clinic by offering free eye exams for those in need. She has also gone on two mission trips to Mexico and has given out over 1500 pair of glasses. In her free time, Dr. Reiter enjoys spending time with her family, especially her two nieces. She actively attends her church. She likes to read books on leadership and business. She loves to travel, going to the beach and snorkeling.